This is very different compared to my other blog posts. My life is not all about my grief, even if my grief does change my life. My four-year-old was so excited about starting kindergarten that he begged me to teach him “school” over the summer. Both Bo and Maggie are at the age where they are incapable of having lazy summer mornings anymore, so I thought it would be a good way to keep them away from the television. After reading a bit about a program called Five in a Row, I thought it would be good to use that format to keep my kids entertained over the summer. In this program, you read a book every day for five days (that’s where the name comes from) and do extension activities from the book. This allows the kids to learn things in context, which I think is super important. These posts will be mostly pictures, I hope, because I just want to document our summer! Our first adventure was the book The Tale of Peter Rabbit by Beatrix Potter. We have read this book a hundred times before, but they were super excited to be doing “school” with it. 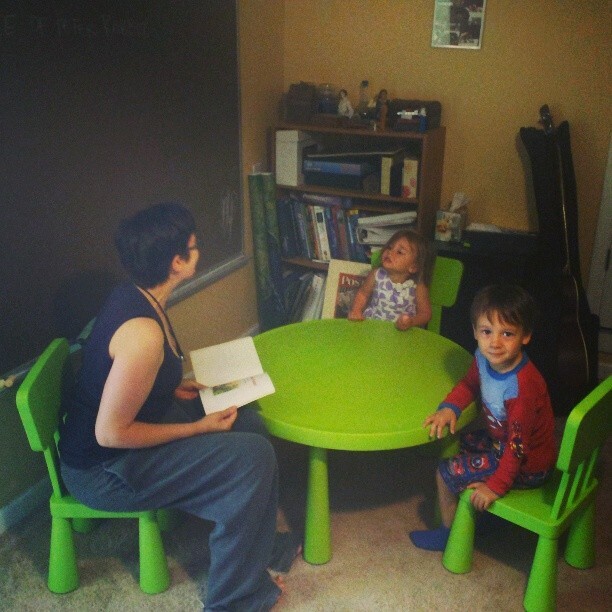 The infant stage of our basement “classroom” with a recycled school chalkboard and a children’s table borrowed from my Kindergarten teacher friend. After reading through the story on Monday, we practiced writing our P’s on the board. Bo discovered he could easily turn his P’s into R’s. Then he wanted to write his name and draw some pictures. 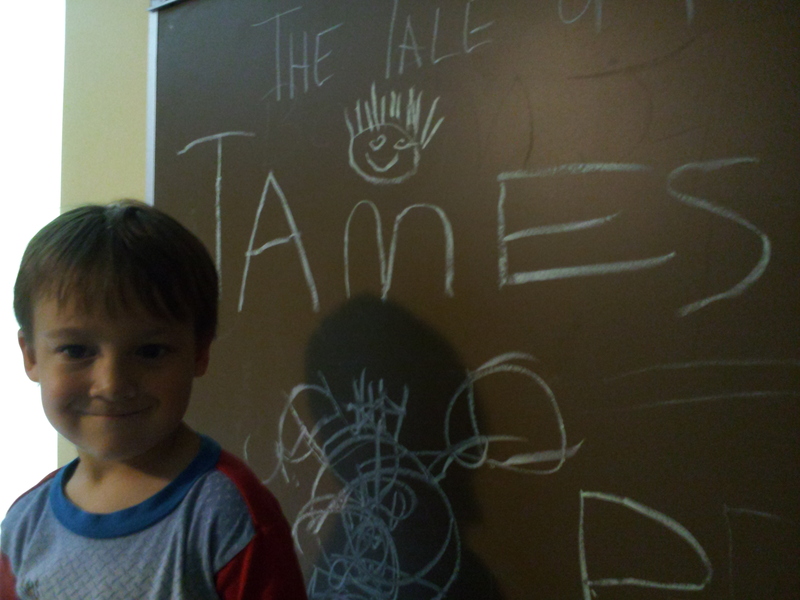 His “big” name and a self portrait. Then we ventured outside to tend to our garden like Mr. McGregor. We talked about the plants that he had in his garden and compared them to the ones we had in our garden. Bo and Maggie helped me label our plants with popsicle sticks. 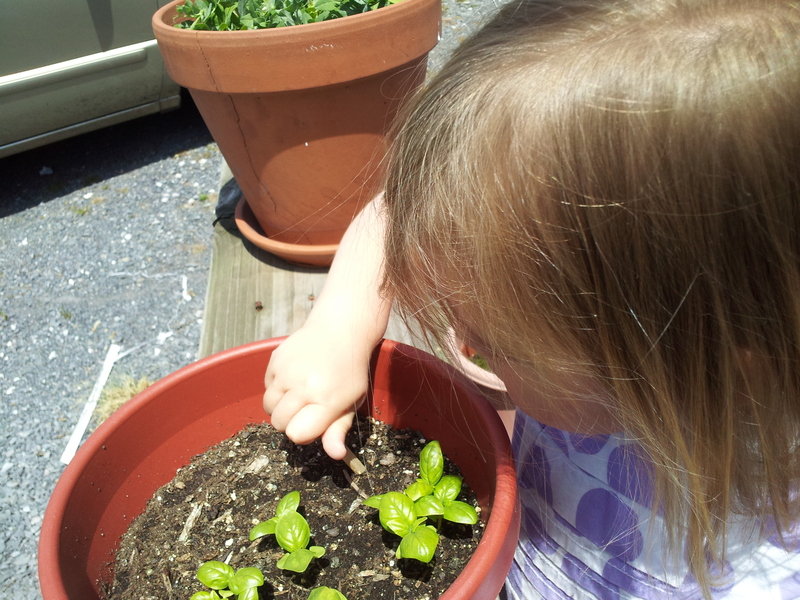 Maggie labeling our basil plant and trying very hard not to touch the dirt. Then we helped Daddy plant our two new blueberry bushes and made a scarecrow similar to the one in the story. Maggie was happy to donate a pair of old shoes, but Bo really wanted the jacket to be blue with brass buttons like it was in the story. 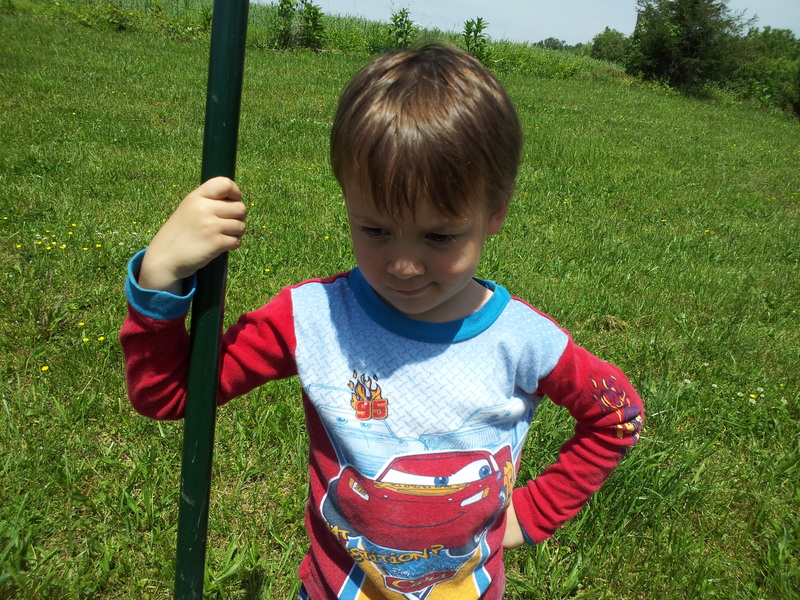 Bo was more than happy to handle a shovel and get in the dirt. Maggie tried very hard not to touch anything. Will this scarecrow keep the wild rabbits from eating the leaves off of our blueberry bushes? I hope so. And that was all day one! Day two was a little more simple. We read the story again and we talked about how Beatrix Potter is a storyteller. I showed them some random pictures and asked them to tell me stories about what was happening in the picture. Maggie loved this, but Bo was afraid that he would be wrong and he didn’t want to try. 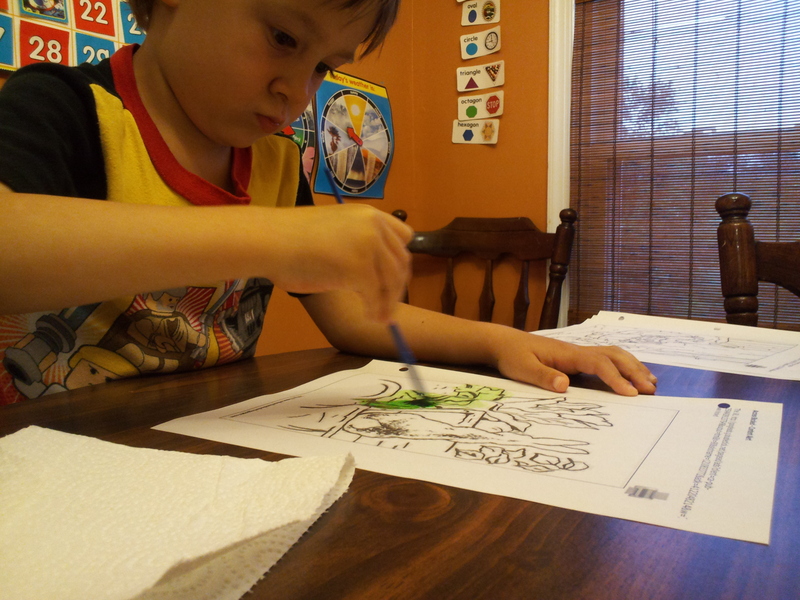 So we moved on to watercolors after looking at Beatrix Potter’s illustrations. We talked about how adding more water would make the colors lighter and less water makes it darker. Then they painted until dinner was ready. They were surprisingly interested in this and made very little mess. Maggie the Artist at work. 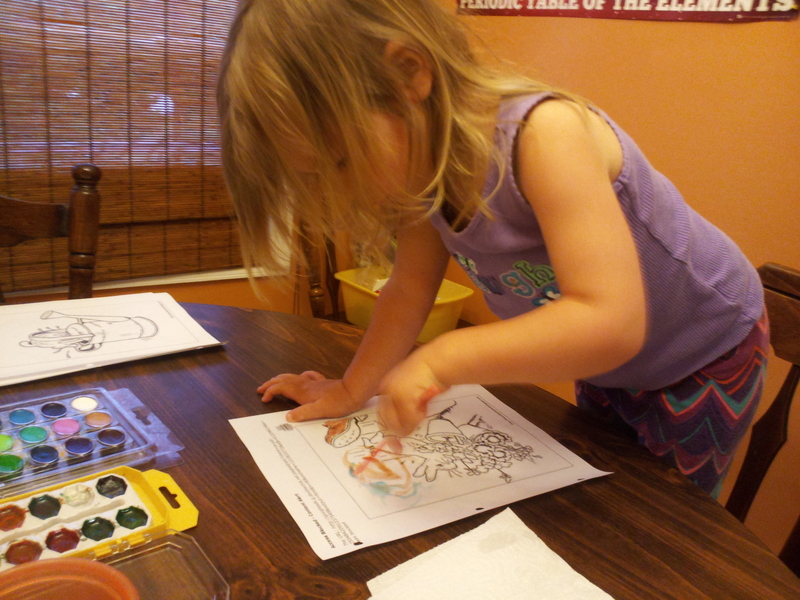 Working hard to stay in the lines and use the “right” colors. Day three was about numbers and counting. I used a Hide the Trowel game I found on Homeschool Creations and they had a lot of fun with that. For the first time, Maggie and Bo really wanted to branch off and do different things. 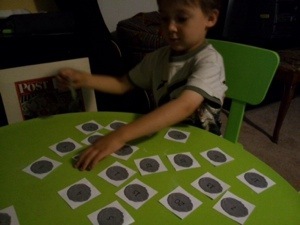 Maggie was not interested in practicing how to write her numbers, but Bo wanted more and started practicing subtraction. Day four was all about rabbits. 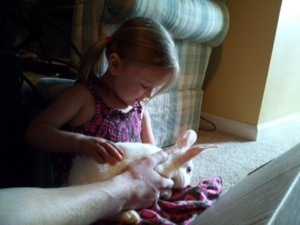 We raise rabbits, so this was fun for us. 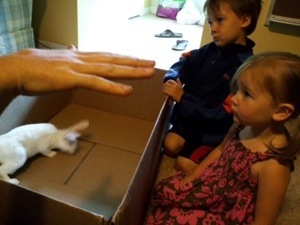 We brought a couple bunnies inside and made some observations using our senses. We compared the two and we held them. 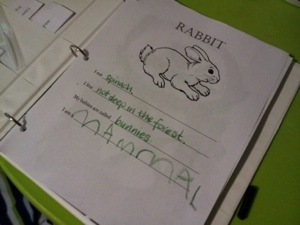 We asked the rabbit expert (aka: Daddy) questions about what they eat and where they live and recorded this on our rabbit sheet. We talked a lot about what makes rabbits mammals. Listening so intently while daddy teaches about rabbits. And today was our last day with Peter Rabbit. At this point, my kids were practically telling the story themselves as I read it. They weren’t tired of it – they just knew it really well! Today we talked all about the United Kingdom and England. We looked at pictures of major landmarks like Big Ben and Buckingham Palace. We also looked at pictures of the royal family and iconic English things like double decker buses and red telephone booths. They colored a picture of the flag. 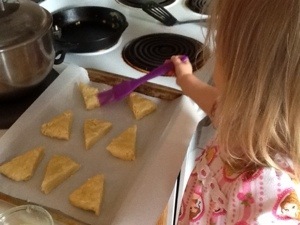 Then we went up to the kitchen and made some cinnamon scones and had a fancy English tea using my china. Brushing the tops with egg whites. This may sound like I was asking for trouble allowing my two and four-year-olds to use my fancy china, but they were great with it! Plus, it’s just china! Sipping tea from fine china and licking the cinnamon sugar off her fingers. 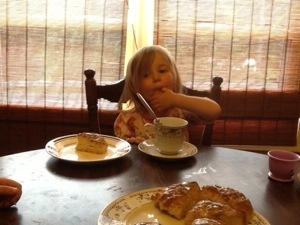 They loved their scones and were practicing holding their pinkies up while sipping their tea. They kept referring back to an episode of Max and Ruby they watched where the main characters went to England and met the queen. I loved that they could make those connections. We finished by finding England on the world map. I haven’t done this yet, but I had every intention of having little medallions we could pin to the map for each book we read this summer. All in all, this was a great success. The kids look forward to school every day and they are eager to learn. It has kept them us away from the TV and most importantly, it has given us many great adventures together as a family. Next week? Mama, Do You Love Me? by Barbara M. Joosse.